Jurassic Jackpot is Microgaming powered pokies games full of Jurassic adventures in the prehistoric forest full of dinosaurs. This classic 3-reel, 1-payline pokies machine can be played for free or for real money. This game lacks bonus features, but it still offers high payouts, the maximum of which is the jackpot win of 1600 coins. On the reels of this game you will see symbols like tyrannosaurs, dinosaurs heads, single, double and triple bars and red flowers. In the Jurassic Jackpot game you can see ancient predators, which became extinct millions of years ago. 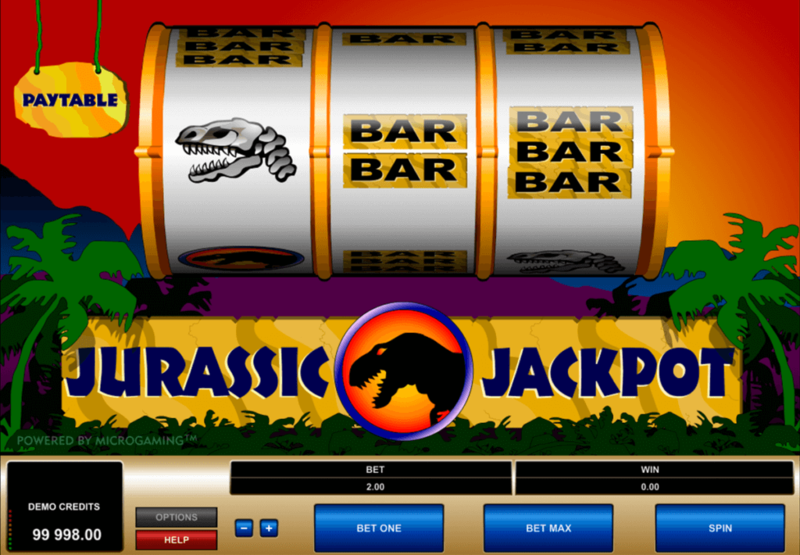 The Jurassic Jackpot free classic pokies game has only one special symbol on the reels. This is the Tyrannosaurus image and this symbol is the Wild icon. However, this Dinosaurs image is not the ordinary Wild symbol, because wins from combinations with its participation can be doubled or quadrupled. This means that, when there is one Wild symbol in the winning combination, your wins will be doubled and when there are two of them, you can easily multiply your prize by four. In addition to all this, the Tyrannosaurus symbol of this pokies game is also the jackpot icon. You will need to get three Tyrannosaurus symbols to win the highest prize. However, you should play with the 2-coin stake to do this. On the other hand, when you choose the 1-coin bet in this game and your win will be 800 coins.